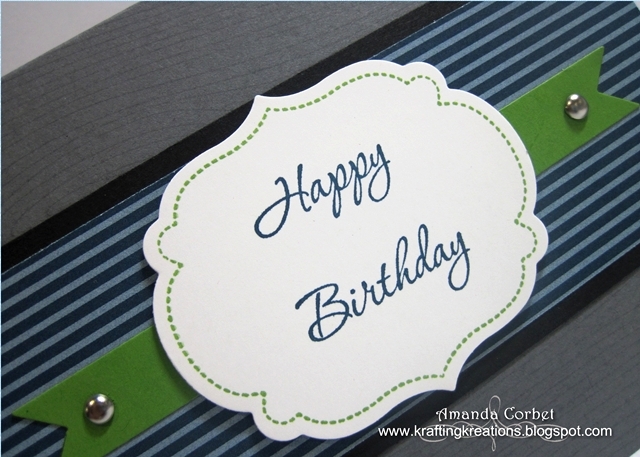 This card started off with a piece of Basic Gray card stock cut 5-1/2” x 8-1/2” and scored at 4-1/4”. 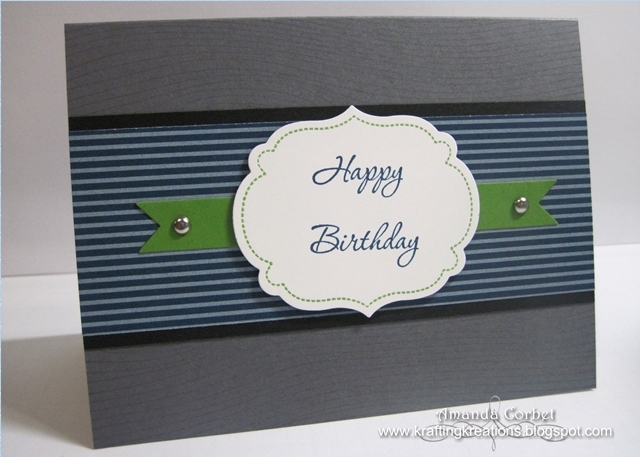 I used my all-time favorite background stamp, Woodgrain, with Basic Gray ink to add some pattern to the card base. Next I cut a piece of Midnight Muse DSP 2” x 5-1/2” and adhered it onto a 2-1/4” x 5-1/2” piece of Basic Black card stock. I stamped the label frame from Memorable Moments onto a scrap of Whisper White card stock in Gumball Green ink. I stamped the greeting from Memorable Moments inside the frame in Midnight Muse card stock. Here is a little tip, when stamping the greeting like this where it’s two individual stamps put both stamps onto the block at the same time. That way you can line up the text so the bottom word is parallel with the top word. Then you only have to worry about trying to get it straight with the label once. I cut out the stamped label with the Labels Frameilts in the Big Shot and adhered it onto the striped DSP with a couple Stampin’ Dimensionals. I cut a scrap of Gumball Green card stock with the large straight banner from the Bitty Banners Framelits. I cut the banner in half with Paper Snips and adhered the banner halves on either side of the label. Next I used my Stampin’ Pierce Mat and Paper Piercer to pierce a hole at the end of each banner piece and added a Silver Brad. Then I adhered this layer onto the card front. I always seem to reach for blue or green when creating a masculine card. Or some kind of neutral like Basic Gray or Crumb Cake. I find it harder to make a masculine card from brighter colors. I don’t know why. I will have to push myself out of my comfort zone next time I create a masculine card. What do you struggle with the most when creating manly projects? Do you have any good tips?